SBM News - Shanghai ShiBang Machinery Co., Ltd.
What’s the root of behind the international financial crisis which that has swept over the world? Does it influence Chinese economy a lot? How should enterprises responserespond to it? And what is the driving force for sustainable development of individual and enterprise? On August 10, Pro. 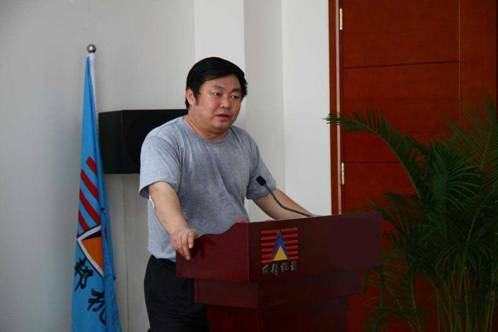 Liu Wei, Chinese famous economist, president of the Economic Dep. of ZZU, and Director of MBA center, dilievered a speech on “ Reasons of Financial Crisis& Solutions To It ”. More than 30 people including Chairman of the Board and main leaders of SBM have attended the meeting. Chairman of the Board, department managers and SBM employees attended the meeting. All are greatly inspired by Prof. Liu’s speech and resolve to make their own contribution to the development of the company and the country. SBM will invite more influencial people come to give lectures or deliever speech to improve corprate culture and working staff’s comrehensive ability.